We are a highly acclaimed company in the manufacture, supply and export of Non Stick Kadai. 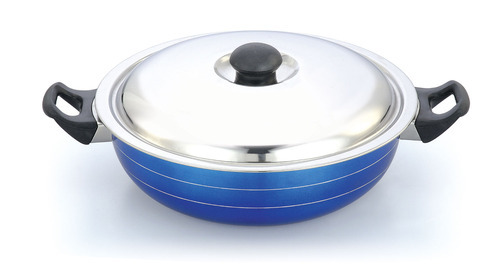 These kadai are of compact sizes, excellent designs and widely used for cooking purpose in domestic kitchens. Besides, these are tested at our well established testing unit under the expert supervision of experienced professionals. Last but not the least, these kadai have minimum oil consumption and are offered at cost effective prices to our valuable clients. Diamond Metal Corporation is engaged into manufacturing, supplying and exporting of SS Insulated Products, Non Stick Cook ware, Induction Cook wares, and Kitchen Cook wares. The organization is located in Chennai, Tamil Nadu and came into formation in the year 1992 as a sole proprietorship firm. We have given people a new vision by helping them have high utility cooking wares used in homes, infact we have helped in transforming the cooking methods in homes. The entire product range is known for its excellent quality and various fabulous features as fine finish, excellent design, minimum maintenance, rust resistance, scratch proof in addition to that the whole range is easy to clean, light weight and offers good heat conduction. Our products have been able to successfully mark their place in the homes of various people owing to excellent features it offers.